A prestigious exhibition showing a diversity of styles and techniques, from traditional uses of watercolour to more experimental and innovative paintings. The RI showcases the best of British watercolour and beyond. Ann was elected as a member to the RI in 2018. It will be her first year exhibiting as a full member and in 2019 she will be showing 6 paintings in the annual exhibition. Ann will be attending the private view on April 2nd. On April 3rd she will be in the gallery to offer informal portfolio reviews. See following link for further information. Please note ‘small’ portfolio as there may be a queue! Ann and her father’s work were featured in several magazines throughout 2018. In April 2018 she wrote an article for Cotswold Life called ‘Like father, like daughter’ about her own life and painting and those of her late father, John Blockley (1921-2002). 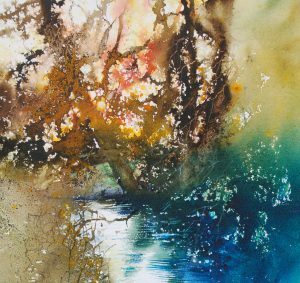 In May 2018 edition of the Artist magazine there is a series of revised excerpts from her book ‘Watercolour Workshop’. In June 2018 edition of Artist and Illustrator there is an article about Ann written by journalist Sally Hales, following a visit to Ann’s studio. There is also a short extract from Watercolour Workshop.